Most people in the US know chicharrones as the Mexican fried pork skins that have become such a popular snack over the years. In Colombia, we call fried pork belly, chicharrones, but the meat has to have the skin on and we also make small cuts all across the meat to make it look sort of like a small centipede. These cuts are called legs or fingers and it’s how we always make them. 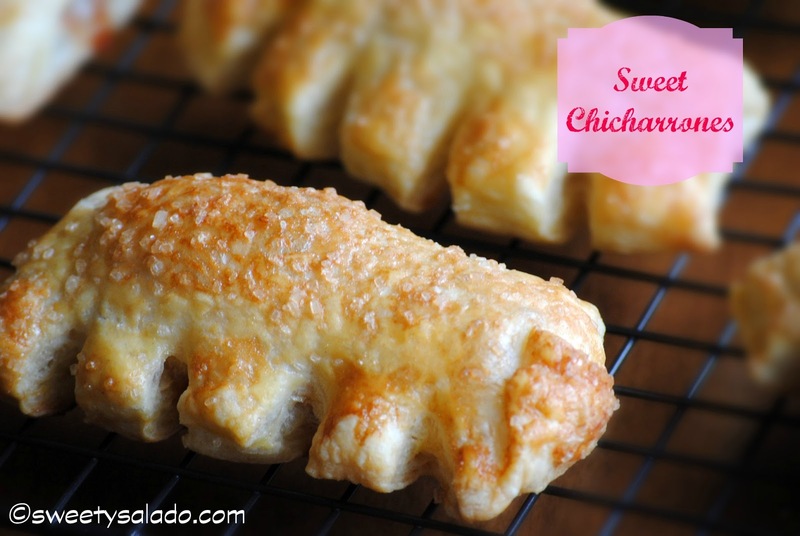 Another kind of chicharrón that we’re very fond of is the chicharrón de dulce or sweet pastry that is filled with either guava paste or guava sauce and it’s deeeeelicious! When you go to Colombia you see them at every bakery and they’re so addictive that you can’t just have one, you always end up eating 2 or 3 in one seating. And the reason we call them chicharrones is because they have the same shape as the salty ones that are fried, except these are baked in a buttery puff pastry filled with sweet guava and covered in sugar. You will find guava paste or jam/sauce at most Latin grocery stores but I’ve also seen it being sold at regular grocery stores from time to time. Like I said, these are made with puff pastry and you can make your own (hats off to you if you do) or simply do as I do which is buy it frozen since the stuff you find at the stores is just as good as the real thing. Some bakeries will also sell it by the pound, especially if you live in Latin American countries. I really hope you enjoy making these, they’re easy, fast and filled with delicious, gooey, guava goodness. 2. Cut guava paste into thin slices, approximately 1/8 inch (3 mm). 3. Make egg wash by beating the egg with the water in a small bowl. 4. Unfold puff pastry on a floured surface and cut right along the folds, this should give you 3 large pieces. Flour a rolling pin and roll out each piece to make it about 3-4 inches wide (10 cm). 5. 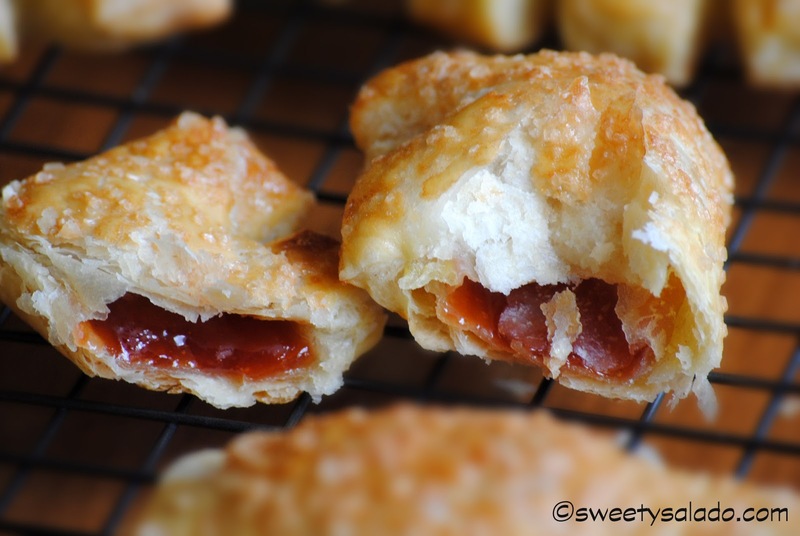 Put three slices of guava paste on each long piece of puff pastry. Brush the top and bottom edges with the egg wash, fold over the guava pieces. Press with your fingertips to seal them. 6. With a small knife make small cuts along the edge to form the legs of the chicharrones, then cut them into three big pieces, one for each guava slice. 7. Brush the top of each chicharrón with the egg wash and then sprinkle with sugar. 8. Put chicharrones on a cookie sheet covered with parchment paper and bake them at 350ºF (180ºC) for about 20 minutes or until golden brown. 9. Let them cool for a few minutes before serving. Hola Carolina, en el blog todavía no tengo la receta para hacer hojaldre ya que siempre la compro congelada en el supermercado. Si puedes conseguirla ya hecha en Brasil, que estoy segura se debe conseguir con facilidad, entonces la puedes usar para hacer esta receta y también la receta de los pasteles de arequipe (dulce de leche).